You've probably heard the phrase, "There's nothing magical about January 1st," but when Baby New Year makes his appearance, we can't help but naturally think about all the fresh starts we are going to make, all the changes we want to implement and all the possibilities the next twelve months will bring. When you flip the page on the calendar, I bet your to-do list rapidly multiplies with #allthethings you want to do in the new year. And because your'e a boss, these new ideas will only continue to find you throughout the following weeks and months--while you're in the shower, in the carpool lane, making dinner, in the middle of a new episode of Grey's, and sure enough....right when you're half asleep. Coming up with new boss ideas isn't the problem. The real struggle is figuring out which of these amazing, potential gold-mine, game-changing ideas to take action on. It's the 21st century after all, and we haven't quite figured out cloning (yet). 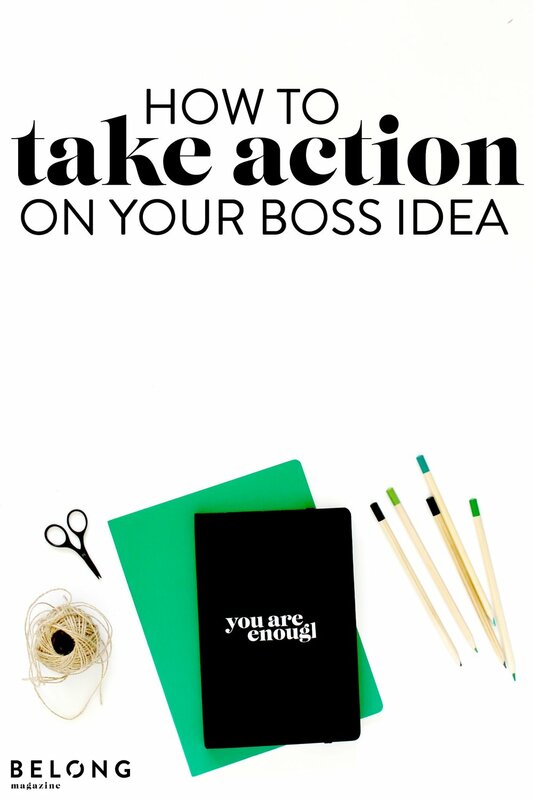 So instead of pulling your hair out, here are several tried and true steps for taking action on your boss ideas. Choose your weapon of choice, whether that's a notebook, bullet journal, scrap of paper or a clean Google Doc and begin writing anything and everything that is taking up residency in your brain. It doesn't have to be perfect because this will only be for you. Next, comb through your new list and use highlighters, crayons or colored pens to group like items together. Use various colors to begin ordering your list by priority. If you're feeling fancy, you can create a legend so you'll always be able to decipher what the different colors mean. Once you have your list grouped and prioritized, the next step is to create a calendar in order to begin scheduling your action steps. A few favorites of fellow bosses are Trello, Asana, Google Sheets and a paper planner. Your boss ideas are likely to consume your every waking thought, but you still have obligations like client work, guest posts and meetups galore. To keep moving forward on your ideas while maintaining other responsibilities, create a habit and commit. For example, perhaps you'll decide to work on your boss ideas for one hour three times a week. Or maybe you'll work on your idea every day for 30 minutes. Even if you only complete one small step a day, in no time your goal will be achieved. Find an accountability partner to help you follow through. With these steps for taking action on your boss ideas, you have the tools you need to begin moving forward on your big goals. The biggest hurdle will be finding a system that works for you, but once you nail it down, it's full steam ahead. After you successfully wade through all the ideas swimming in your head, you'll feel a wave of relief. What has helped you take action on your boss ideas in the past? Where do you struggle to see these ideas to completion? Holly Meyer is the owner + creative director of Holly Meyer Design, a boutique studio specializing in unleashing the inner roar of wholehearted solopreneurs and small creative businesses through intentional branding, web design, and design education. Holly is passionate about collaborating with creative entrepreneurs to inject new life into their brand with the perfect visual design that tells their unique story + deeply connects with their dreamiest tribe. She lives in eastern North Carolina with her lively cat squad.